Order before 9pm for free next day! You can use this for free any type of delivery, I used it for a nominated delivery slot, which is usually £7.99. I'm so pleased because the jacket I ordered also had 18.00 off the original price so made a massive saving without leaving the house and the bonus is you can return items in store! Sign up to H&M club to receive the discount. Only discount available at the moment is through the H&M club which is 10% …Only discount available at the moment is through the H&M club which is 10% off and free delivery. 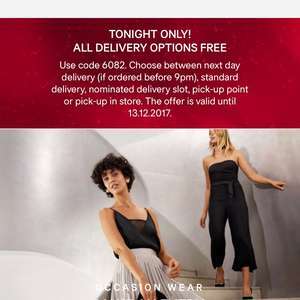 This ends 14/12/17Sign up to H&M club to receive the discount. Voucher posting newbie! This is fayeseybell first voucher post. Help out by leaving a posting tip or just to show your appreciation for their contribution.